Note: You can find more photos and information on each plant mentioned here by accessing the individual plant pages in the "Site Plan/Archive" menu or using the links below. 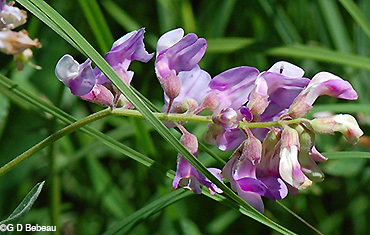 The pea family is a large and varied group of plants most often associated with prairies, meadows, and roadsides. It includes all species of clover, indigo, and tick-foils, as well as many European introductions that have become eradication nightmares. As legumes, they all have specialized nodules on their roots that have the ability to ‘fix’ nitrogen from the atmosphere -- a great asset for soil enrichment. Twenty-two species from the pea family are growing in the Garden. They range from highly desirable, showy species to ‘weeds’ that grow in disturbed soil along the Prairie path. 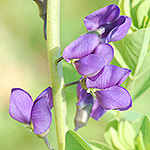 False Blue Indigo (Baptisia australis (L.) R. Br.) 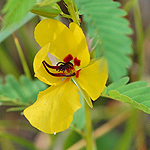 [photo left] is a visitor favorite during the early Prairie bloom. This introduction to Minnesota has showy blue flower spikes followed by seed pods that rattle in the wind. While somewhat vigorous this bush-like flower is not invasive and is simply breathtaking in combination with the Golden Alexanders (Zizia aurea). 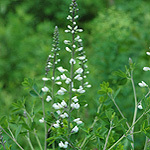 False white indigo or Prairie Indigo (Baptisia alba (L) Vent.) is native to Minnesota. Although it is slower growing than blue indigo -- often taking 4 to 5 years to form a nice clump, it is long-lived and a wonderful complement to our prairie. A much smaller indigo, Cream false indigo (Baptisia bracteata) can be found in the Garden, but our one example is far off the path and usually not seen by anyone. Dalea candidum Michx. ex Willd. Three of the most prized members of the pea family are native prairie clovers: White Prairie Clover, (Dalea candidum Michx. ex Wild. 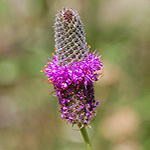 ), Purple Prairie Clover, (Dalea purpurea Vent. ), and Bush Clover (aka. Roundhead Lespedeza (Lespedeza capitata Michx). White prairie clover blooms from the stem up giving the two-foot flower a thimble-like appearance. The stalks were often dried by Native Americans and tied together to form small brooms for sweeping. Purple Prairie Clover is similar to White Prairie Clover in form although the flower is smaller. Both are used as a tea and are said to calm an upset stomach. Prairie Bush Clover has a creamy-white flower that turns into showy brown seed heads in the fall -- a favorite food of goldfinches. Everyone is familiar with common White clover (Trifolium repens L.) -- the nemesis of the lawn purist. This is a mild nuisance along pathways in the Garden, as is Red Clover (Trifolium pratense L.). 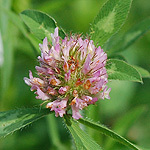 We all know Red clover as the sweet-scented clover used in farming as forage. 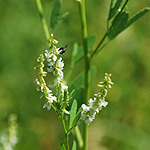 The last two clovers are annuals- White Sweet Clover and Yellow Sweet Clover (Melilotus officinalis (L.) Lam.). (Both have the same scientific name). These two ‘weeds' are really pioneer plants and often exist in disturbed soils until more long-lived perennial plants take their place. Anyone who has driven to Minnesota’s North Shore is familiar with Wild Lupine (Sundial Lupine) (Lupinus perennis L.). The blue-violet spikes of its flowers make huge weeps of color along the sandy roadsides of northern Minnesota. While we do have some lupine in our prairie it doesn’t seem to compete very well in rich soil and seems to need an open, less fertile habitat. Leadplant (Amorpha canescens Pursh) derives its name from the gray color of the leaves that contrast nicely with the purple flowers. 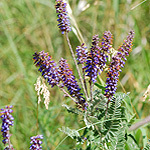 This plant is often used as an indicator of a virgin prairie and is so deep-rooted that it is virtually drought resistant. Finally, a word of caution: While legumes are an integral part of any prairie plant community restraint should be used in a home garden situation. In friable, fertile soil many of these plants can be somewhat aggressive because of their nitrogen-fixing ability. Keep this in mind with your selections and limit your use of tick-trefoils and especially vetches. This article was originally published in The Fringed Gentian™, Summer 2002, Vol. 50, No. 3. Certain plant names have been modified to updated usage standards. 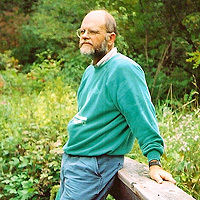 Cary George was Gardener at the Eloise Butler Wildflower Garden from 1987 through 2003 and was the fourth person to be in charge of the Garden since its founding in 1907.